About 50 people gathered at The Rock on Tuesday to rally for non-tenure eligible faculty, calling on the University to bargain with their union and raise wages. Representatives from several student groups — including Rainbow Alliance, ZOOZ, Asian Pacific American Coalition and For Members Only — spoke at the rally to show support for non-tenure eligible faculty members. Northwestern has refused to bargain with the group due to several contested ballots from a June 2016 election. Majority support for joining Service Employees International Union was confirmed in May, but the University will not begin negotiations until the SEIU withdraws its objections to 25 uncounted ballots. According to a National Labor Relations Board document obtained by The Daily, the uncounted ballots could play a decisive role in the election — 229 non-tenure eligible faculty voted in favor of joining SEIU, and 219 voted against it. 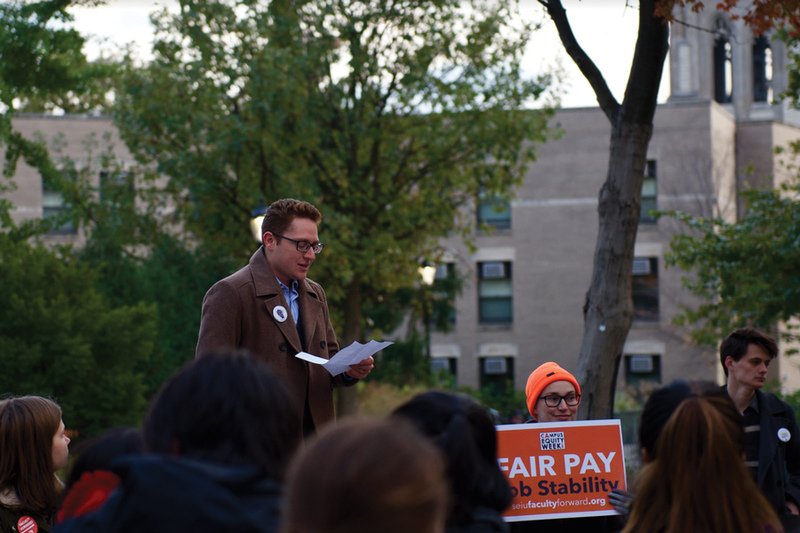 The union filed unfair labor charges against the University in September for its refusal to bargain. Visiting sociology Prof. Jackson Bartlett told The Daily the union is gaining allies on campus. University spokesman Al Cubbage told The Daily in an email that the University “has sought to have all voices heard,” and reiterated that the University wants to ensure all uncounted ballots are opened. Jade Mitchell, FMO’s assistant vice coordinator of programming, represented the group at the rally. The Communication senior said she wanted to support non-tenure eligible faculty, some of whom went into debt to attend graduate school and become credentialed to teach. Weinberg sophomore Seri Lee, an APAC member, attended the rally and told The Daily that some of her best professors were ineligible for tenure. Lee said students can put pressure on University administrators to treat professors more fairly. The non-tenure eligible faculty union received support not just from undergraduates, but from graduate students too. Doctoral student Zach Angulo told The Daily he came to represent Northwestern Graduate Workers, which aims to help graduate students unionize. Bartlett — the visiting sociology professor — said the “end goal” is to begin bargaining with the University.